The purpose of this series of articles is to look at the benefits and design issues associated with the provision of air conditioning and other services through a raised access floor. The first Trane Company Air Conditioning Manual published in 1938 defined air conditioning as the simultaneous control of temperature humidity, air movement and the quality of the air in the space. It is interesting to note that indoor air quality was a concern to engineers all those years ago and to this description many people would now add noise control. 0.18-0.2 m/s and good air movement should be maintained, which coupled with the introduction of outside air will help avoid stuffiness and dilute pollutants such as body odour, ozone and formaldehyde and other volatile organic compounds. Good filtration should be provided to remove irritants from the air such as pollens and allergens. To avoid potential sick building syndrome problems, and to comply with CDM and Workplace (Health Safety & Welfare) Regulations, air conditioning systems must be easily accessible and easily cleaned. Sustainability is now a political and business issue. Pension funds, a prime source of funds for development, must report annually on their environmental strategy and performance. Sustainability touches on every stage of a project's development and it behoves all of us as designers and installers to do all we can in meeting these goals. The cycle of demolish-develop-operate-demolish has to be curtailed and a better way found to modify a building over its lifetime. By considering the aspirations and needs of the occupants at all stages of the development and operation of a building and by designing a system that is flexible enough to meet those needs and aspirations we can provide a better internal environment with improved comfort, while reducing operating costs. Outdoor pollution due to demolition etc may also be reduced. 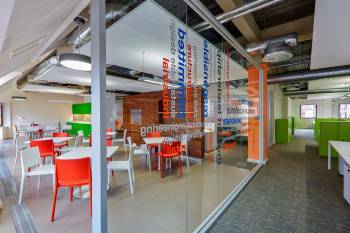 Change is a fact of life in the modern office, whether it be a simple change of layout to reflect changing tenant need or a full-blown refurbishment. This continuous need to change is now part of the modern office life and has been given its own jargon word 'churn'. In addition, many aspects of office design are now affected by legislation and operators have the task of adapting systems to meet changing legislation and office layouts. In London, a leading journal reported an average 'churn' of 80% in the first year of operation, tailing off over a period of years to around 30-50%. This is a high cost to the building operator. Air conditioning systems have tended to be either central station systems in a variety of configurations or smaller diversified plants such as variable air volume (VAV) systems and fan coil systems. These are generally designed on a modular basis and installed as a rigid inflexible system, and very much a part of the building itself. In the drive to achieve economy the size of the basic air conditioning design module has increased, creating problems with control and adaptability. At the same time, systems have tended towards high volume/higher temperature differential solutions with reduced fresh air, but this has led to increased complaints of draughts and noise with increased stuffiness and odours. Building services engineers charged with addressing these issues have had to reconsider the options available. For some it has been found that air introduced from a low level offers improved conditions in the workspace, while offering additional benefits in cost and time. Early developments in Sweden led to the system called displacement ventilation but as it is essentially a ventilation system with limited cooling (maximum 60 W/ m2) it does not fully meet the definition of air conditioning and cannot meet the design cooling requirements in most offices. Generally both a raised access floor and a false ceiling are required. Displacement systems utilise the raised access floor to supply filtered outside air into the occupied space. For cooling applications, the air is introduced approximately 3°C below room temperature to avoid complaints of draught through swirl grilles or perforated plate outlets across the floor. This air picks up heat from the occupants and machinery, along with solar and fabric gains, and rises to high level under natural buoyancy. Ceiling extract grilles remove this air, avoiding re-circulation. The low temperature difference between the supply air and the room air necessitates high supply air quantities and thus cooling loads are limited to no more than 40-60 W/m2 which is considerably below the norm for modern office buildings. Because of the large areas they serve, displacement systems often have a demand for heating and cooling within that large area. 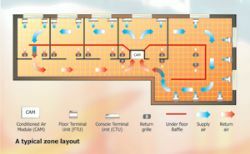 Additional equipment in the form of underfloor fan coils or electric trench heating is often applied at perimeters to reheat the cool air and introduce it into the space. However, because this warm air is naturally buoyant it rises to a high level and is exhausted before completely heating the space. The heating efficiency is therefore impaired. Zones are usually large and therefore can provide only an average humidity, which often leads to complaints from users. Using large central station plants for the treatment of air supply requires floor voids of approximately 600 mm deep for the supply ductwork, room heights in the order of 2.7-3.2 m and a ceiling void of about 600 to accommodate the exhaust air and chilled ceiling equipment. Of course, the extra space needed to house the system means an increase in the cost of construction and although users find that such systems are quiet in operation, they restrict flexibility, ceiling design and lighting design. The environment created by displacement ventilation is reasonable but offers little or no personal control over conditions. A large number of swirl grilles are needed and care should be taken in their selection and location, as draughts at low level may be a major problem. This system has only limited application in offices and other spaces of low height as the desired stratification cannot be achieved. Displacement ventilation offers a high level of free cooling in mid season but in mid winter, when the supply air requires tempering to about 18°C, it can be energy demanding. Restricting the volume to reduce the energy requirement further limits the cooling capacity. Displacement systems are well suited to large open areas with high ceilings (above 3 m) but tend to have a high demand on building fabric costs, and are of limited use in spaces with high heat loads because of the low cooling capacity available. As a result they are often teamed with a secondary system of chilled ceilings and chilled beams. Additional cooling is delivered by chilled water running in pipes incorporated in ceiling panels or beams and are placed as part of the false ceiling. This offers a total cooling capacity in the order of 120-150 W/m2, but the cold ceiling may cause some 'displaced' air to fall back into the room carrying with it some of the contamination. Where there is a high latent load causing high humidity, the possibility of condensation occurring on cold surfaces of the metal ceiling can be a concern. Controls can be incorporated to raise the surface temperature in such conditions, but this in turn reduces the cooling capacity often at the time when it is most needed. Mixing systems ensure good dilution whereas true displacement can have quite high levels of pollution carried in the ascending air as previously demonstrated by cigarette smoke trails in offices. Zonal systems are now receiving a good deal of attention from developers and end users. · Floor void supply - ceiling return (zonal displacement systems). · Floor voids supply - floor void return (zonal mixing systems). Both have their advocates, but in low height office space (2.35-2.6 m) the notion that fumes should be exhausted at a high level is somewhat flawed because the amount of mixing that takes place in such spaces, caused by the occupant movement, door swings, etc, can render such design intention almost possible. These systems devolved out of close-control systems used in computer rooms and similar applications. They both use a purpose-designed package air conditioning unit located within the zone to be conditioned. Treated air is blown into the floor plenum. How that treated air is distributed differs with each system and is explained below. Both solutions rely on central plant similar to that of fan coil systems, but have less on-floor engineering. Compared with central displacement ventilation systems they have much smaller fresh air ductwork and when well designed, lateral ductwork can be almost, if not completely, eliminated, freeing up the floor plenum for data cabling and other systems. The overall height of the floor void may be reduced from 600mm to 200-300 mm and, in the case of zonal mixing systems, the ceiling void too may be reduced or even removed. Both types of systems are served with chilled water operating at a 6°C flow/11°C return to achieve good levels of dehumidification in high occupancy areas. They can provide closer control of humidity to smaller zones and can ensure individual zones maintain higher indoor air quality. · Churn is very easily handled. · False ceilings may be eliminated. Up-lighters and task lighting are used, improving internal appearance and occupant control. · Building heights may be reduced when compared to ceiling void systems, or additional headroom provided. On projects where the height benefit is taken into account, total building cost savings in the region of 5 to 7% may be demonstrated. Zonal displacement systems use the floor void as a supply channel and the ceiling void or office space as a return channel. Zones may be 100-250 m2. They usually work with minimum fresh air rates offering savings in fan power and seasonal peak energy demand. The supply air velocity under the floor may be low and designers should take care to check temperature pickup. Simulation shows that the lengths of the air paths under the floor should be less than 15m. Zone units are optimally positioned near the centre of the zone. Such systems can make use of swirl grilles when the cooling load is small (60-80W/ m2) and the supply temperature can be limited to 18°C, but as with displacement ventilation be aware that draughts around the feet may occur. With higher loads, fan-assisted terminals with vertical distribution should replace swirl grilles. The vertical distribution avoids draughts as warmer room air is entrained into the air stream instead of cooler air being blown across the floor at a low level. These systems are suitable for machine rooms (eg telecoms, computers and other high load areas where cooling loads can exceed 1,200-1,500W/ m2) where air can be introduced directly into the case of the equipment at a low temperature. Such fresh air is usually ducted to the top inlet of the zonal unit. 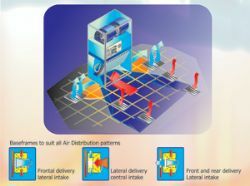 This system has a more complicated ventilation distribution and exhaust system than zonal mixing systems and care must be taken in the design of the return air path to avoid short-circuiting. System noise levels can be in the region of 40 NR. Zonal mixing systems make use of the floor void as both supply and return channels, through the application of air segregation baffles usually fitted to the raised floor sub-structure (metal ducts are not used). The actual division of the floor void into supply and return will be dictated by the office layout above. Zones may range up to 300 m2. Filtration may be required to reduce or remove pollen and other allergens and thereby reduce hay fever and other similar complaints. The individual fan-assisted terminals are suspended in the floor to introduce the conditioned air into the occupied space. Users have the freedom to adjust both the temperature set point and fan speed on the unit. The space temperature is controlled by the flow rate of air introduced which, in turn, is usually controlled by a damper operating under the dictates of on-board sensors. The need for wall-mounted thermostats is therefore eliminated. Air returns to the zonal unit are via simple return air grilles positioned above the return air plenum in the raised floor. Fresh air may be introduced into the return plenum or directly to the unit and exhaust air may be extracted through toilets, kitchens and additionally through exhaust air grilles at high level if required. In offices where cooling loads are high, zonal mixing becomes more attractive than zonal displacement as it can achieve cooling loads up to and in excess of 250 W/m2 without undue draught, while offering the possibility for effective warm air heating in perimeter zones in winter and cooling in summer. Office heights can be kept within 'pension fund' limits of above 2.5-2.6 m and thus the overall floor-to-floor height of the building can be in the region of 3.2-3.6 m overall compared with 4.5-5 m for conventional displacement systems. This offers dramatic savings in cost and time of construction. Savings in the order of £60 W/m2 are not uncommon in standard office developments. 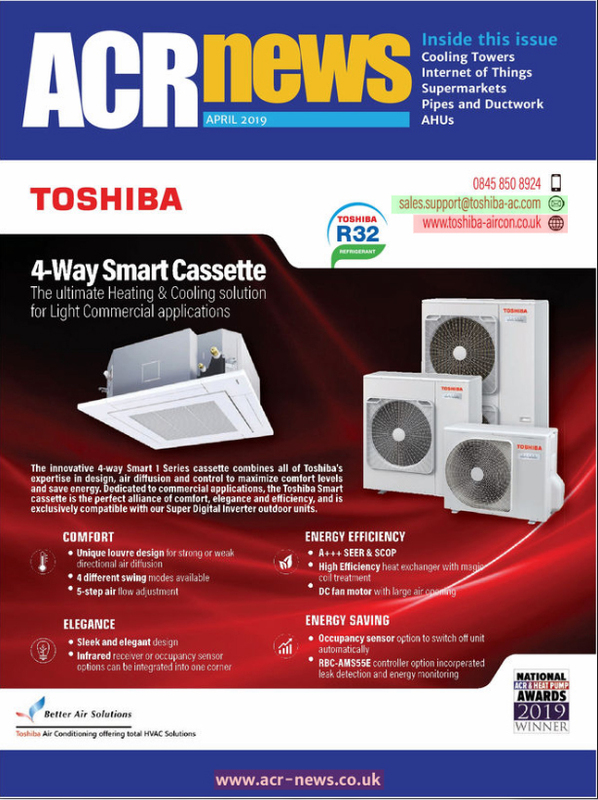 High levels of cooling can be achieved through the use of fan-assisted terminals which introduce about 500 m3/h of conditioned air into the space vertically instead of horizontally, thus permitting high induction and lower supply air temperatures (e.g. 14°C) to be applied. This allows in the region of three times more cooling to be achieved for the same volume of air distributed. Ventilation efficiency is high because of reduced short-circuiting compared with ceiling-based systems. These terminals, while offering about 1.3-1.5 kW of sensible cooling and generally located every 12-15 m2, often offer personal control of fan speed and temperature set point and leading solutions have fully intelligent links to the central building management system, permitting the use of internal protocols for pc-based personal control and management. With low supply temperature conditions it is advisable to run the computer calculation for condensation and possibly apply insulation and a vapour seal to the underside of the slab, although this is rarely required. Maximum supply air to room temperature differentials should not usually exceed 10°C. The velocity of the air should be in the region of 102 m/s to minimise temperature pick-up and avoid pressure build-up. Paths can be extended under the floor 15 m to 20 m but, with careful design, distances of up to 30-35 m may be accommodated. System noise levels are in the region of 32-35 NR. In today's environmentally aware society the continuous round of 'develop, build, demolish and re-build' is no longer acceptable. Buildings need to be built that are flexible and able to accommodate a client's changing needs and, at the same time, meet the requirements of ever changing legislation. It has been estimated that British business has in the past spent over £2 bn a year on moving people or departments inside offices in response to organisational change. As a project progresses, the scope for specifying flexible building services reduces - with an increase in associated cost. The installation of air conditioning and other services, within a raised access floor gives very high flexibility and can handle very high rates of churn in a cost effective and timely manner. However, it is essential to commit to this concept at a very early stage in the design if the full benefits are to be achieved. Installing all services in a raised access floor gives freedom and flexibility to the client and designer to develop a building's interior in ways not constrained by the need for a false ceiling with its inherent rigid pipework and ducting systems. Atria, decorative ceilings and other architectural themes are easily accommodated. Using a raised access floor for services negates the need for a false ceiling and often avoids the requirement for a floor screed. This can result in a height saving of at least 300 to 400 mm per floor. In designing a speculative building it is beneficial to be able to provide services to meet all likely tenant needs. In a normal office this could result in wasted capacity resulting in wasted capital for the investor and possible increased utilities and maintenance cost to the tenant due to the difficulty of controlling over-sized plant. The other alternative is to size the air conditioning system for a normal office environment, and to install boiler and chiller plant to suit, but allow space for additional plant if required to meet a higher cooling load. The risers (chilled water, hot water and fresh and extract air) should be sized for the highest possible load. The building is divided into zones in the normal way but the raised access floor and services, including the air conditioning, need not be installed until the tenant's requirements are known.